The Book I should have written! As someone that has been in the web design industry for over 16 years, I have to say I wish I had written this book and given it to every one of my clients before starting any project! It’s a great basic guide to all the things to do RIGHT with any website. It doesn’t matter if you have a current website or are just getting ready to build one, you MUST read this book and avoid a lot of mistakes I see every day. If there’s anyone who should know about websites, it’s Frank Deardurff – he has designed some of the most successful converting websites in Internet Marketing history, and continues to be two steps ahead of the game at all times ’50 Biggest Website Mistakes’ is a crash course in the do’s and don’ts of website marketing that you THINK you know already, until Frank proves how wrong you really are! Don’t assume ANYTHING – grab Frank’s book TODAY, before you make a fatal marketing error! In the medical world, people turn to specialists. In the online world, I turn to Frank and Bret. They are specialists and experts when it comes to your website. Read this book, and be sure to implement each of their recommendations – your website and business will improve dramatically. 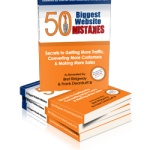 50 Biggest Website Mistakes’ is a must-have reference manual for all online business owners even IF you outsource all of your web design and development. This book serves as a checklist, reminder, and management tool to help you maintain control over all your projects and websites. Hand it off to new web designers and webmasters and make it required reading before doing any project. This way, you can literally turn over your websites and know that it’s done RIGHT with the marketer’s mindset! When it comes to cranking things out on the Internet there are FEW people on the planet who measure up to the level the Frank Deardurff is at! He truly KNOWS what he’s talking about and his book is filled with priceless info you MUST apply if you want to get incredible results online as well! Frank and his expertise come with my HIGHEST recommendation for sure! In the past, I always cringed when people asked me to give them ‘honest feedback’ about their website. Because I knew I was going to see the same mistakes I always see – over and over. Now I can simply hand people a copy of this book and say, ‘Use this as your checklist. When you’ve got all this covered, THEN come see me.’ Do yourself a favor and buy at least 3 copies of this book. One for yourself, one for your webmaster, and one to give to a friend. It’s that good! 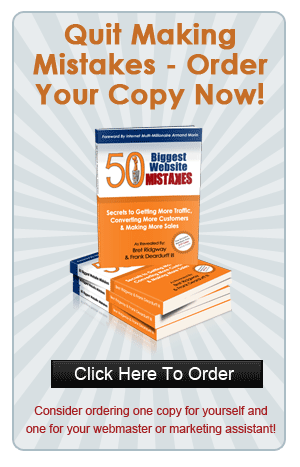 50 Biggest Website Mistakes: Secrets To Getting More Traffic, Converting More Customers and Making More Sales. Co-Written By Bret Ridgway & Frank Deardurff. 50BiggestWebsitesMistakes.com website is from Orange Pixel Inc. and is committed to protecting the privacy of our online visitors. We collect information from online visitors who ask to be on our newsletter mailing list and/or receive periodic email announcements. Anyone who wishes can choose to be removed from our mailing list at any time. All online visitor data collected by 50BiggestWebsiteMistakes.com is protected against unauthorized access. We will not sell, trade, or give your personal information to other companies or organizations. Check out the FTC’s site at http://www.ftc.gov/bcp/menus/consumer/data/child.shtm for more tips on protecting children’s privacy online. 16. This Agreement is governed by the laws of the State of Indiana, without regard to principles of conflict of laws. To the extent you have in any manner violated or threatened to violate 50BiggestWebsiteMistakes.com and/or its affiliates' intellectual property rights, 50BiggestWebsiteMistakes.com and/or its affiliates may seek injunctive or other appropriate relief in any state or federal court in the State of Indiana, and you consent to exclusive jurisdiction and venue in such courts. If a dispute arises under this agreement, we agree to first try to resolve it with the help of a mutually agreed-upon mediator in the following location: Vigo. Any costs and fees other than attorney fees associated with the mediation will be shared equally by each of us. If it proves impossible to arrive at a mutually satisfactory solution through mediation, we agree to submit the dispute to binding arbitration at the following location: Vigo, under the rules of the American Arbitration Association. Judgment upon the award rendered by the arbitration may be entered in any court with jurisdiction to do so. © 2017 50 Biggest Website Mistakes. All Rights Reserved.